My Recent Catches – Darkness offering more consistency. Only time (and of course a lot more fishing) will confirm whether darkness really does offer more consistency. But something very interesting is occurring in regards to how I’m approaching my bass fishing, and how I’ll possibly plan future sessions for prospective clients. So far this season, during daylight hours the bass have generally been difficult to locate – even in what I would consider as really tasty conditions therefore, when the conditions have been more conducive to lure fishing at night (more on that later) I’ve been attempting to make hay while the sun shines! 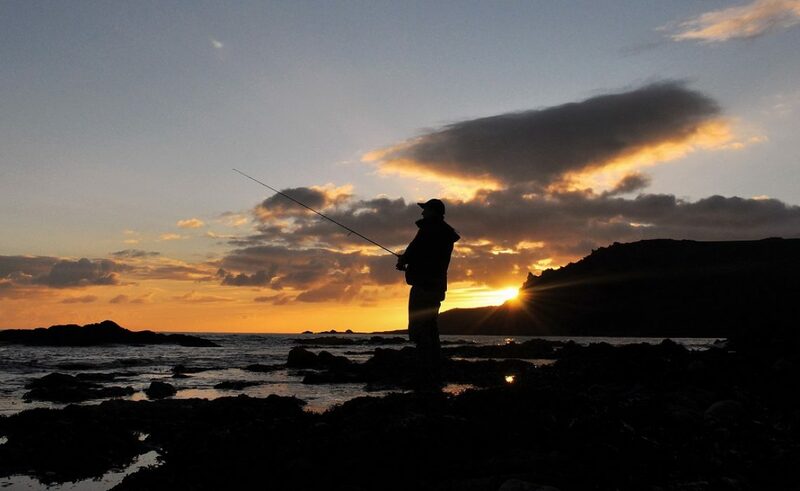 Since my night fishing success back in mid-April here my mind has literally been ‘frazzled’ when thinking about the endless possibilities and potential of the stunning coastline around me. Therefore, in the last few weeks I’ve started to fish these marks just to see if they are indeed as good as they look! As I’ve mentioned before, I’m only interested in fishing from beaches in darkness rather than risking my neck by fishing from my many rock marks (I might be limiting myself here?). All of my ‘test marks’ are shallow reefs with 2 – 5 ft of water over them at high tide, where my feet are firmly placed on shingle or sand. I do have a number of low tide marks in mind, but I just haven’t got around to fishing them yet. The adrenaline from the previous night’s events (where my client nailed 5 bass up to 5 lb on his own needlefish lure here ) was pumping through my veins throughout the entire beautiful, warm, calm summers day – I couldn’t wait to get out there and fish myself later that evening and the anticipation was wrecking me! From chatting to my fellow anglers, monitoring Facebook threads and from my own (limited) experiences of lure fishing at night, it appears that calm, settled, clear water conditions are the best time to head out to fish the shallow reefs and beaches. As I sat there waiting for it to get properly dark (2230) I ran the previous evening’s highlights through my head – a fantastic session for my client, his PB and proof that this mark had all the ingredients I’d hoped it had… But how would I fair tonight? So at 2240 (approx 30 minutes after I arrived) I made my first cast – just a gentle lob, the theory being to work the area closest to me first… BANG!! the rod pulls over!!! Get in!!!! 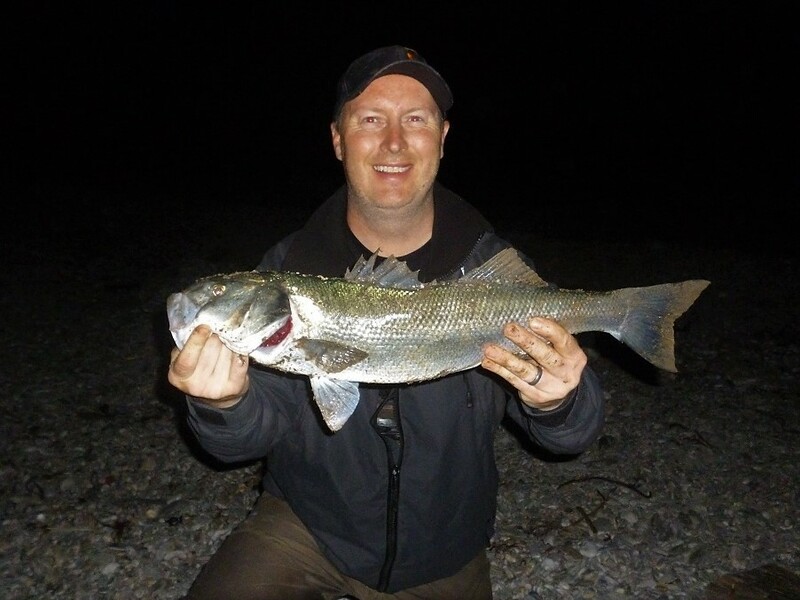 and 1 minute later I’m holding a beautiful 2.5 lb bass in my hands – the smile says it all really (I’m still trying to find the most opportune way to take these photographs at night hence the head-torch on the ‘low’ setting). First cast! The discipline required in order to leave the area alone for 30 minutes was a pain! The next two casts resulted in solid takes that unfortunately failed to connect however, three casts later and I was in again – this time I managed to land the culprit and it was a really good scrap for a bass weighing only 1.5 lb. The next cast resulted in another almost identical bass – I was on cloud nine by this stage! I only had 2 hours available to fish (as I had to be up early again the next day) therefore, to consolidate my actual fishing time, I made a conscious decision (after filming two bass being returned) that I wouldn’t whack the head-torch on again unless I really had to. This smaller one punched above its weight! The next bass really did put up a tremendous fight! Hooked probably 3 metres off the rod tip the hit and run of this one absolutely ripped the rod from my hands – amazing stuff and the with drag singing away I think I was singing as well! I was certainly happy – portrayed in the photograph below as this was the largest one I’ve had this season at a hurriedly measured 63 cm. I love catching bass from the beach – they really don’t like being hooked so close to dry land and this one shook its head with real anger when hooked and was bristling away the whole time that I was her companion! 63 cm – I’m sure she was bigger than that! With two more bass landed from this area, one small one and two of around 3 lb I was obviously extremely happy with the evenings ‘work’ – but I couldn’t resist another couple of casts into the original area. So off I trudged along the beach – a couple of yawns and thoughts of my bed creeping in…. First cast, THUMP…. but then nothing… Second cast and literally one turn of the spool into the retrieve, at a range of 40 metres I had a really powerful hit – the type where the rod just hoops over and remains there with the line screaming off the reel… OH YES!!! here we go! The fish stops, and then runs again with a few thumps of the head and I just know that this is a fish that I want to land – BADLY… The fish stops again, the rod is held high and bent right over – the fish is still at least 35 – 40 metres away still when everything goes slack….. I shouted so loud I didn’t get another bite for 20 minutes! Upon retrieving the needlefish it was obvious what had happened – the split ring had straightened out on the middle section of the lure meaning the fish was also swimming around with a large treble in its mouth which I obviously wasn’t happy about either. I can’t wait to try this again! I am really, really looking forward to fishing this and similar marks during the next run of tides (HW between 2300 – 0100) and fingers crossed that weather is settled and that the sea is flat calm and crystal clear – I never thought I’d be saying that! Previous Guided Bass Fishing – Night time needle lures a PB! Good article Marc. Definitely given me food for thought re: needlefish. I wonder if other lures such as shallow runners or topwaters would also be effective. Thanks for the comment Andy. Indeed, I’ve caught bass on a variety of lures at night this season – surface, senkos, shallow runners and of course, the needles all in very shallow water from beaches.